LuminArte Gallery’s first exhibition of 2015, No Body, No Evidence, Right?,” will explore the ethereal universe of the abstract artist and examine the connection between art and emotion. It will analyze whether there is evidence of existence within abstraction or if it is merely a spontaneous reaction to materials. 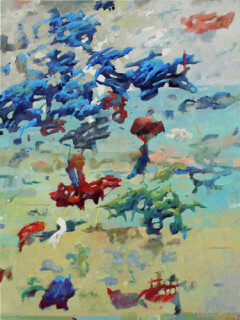 In this eclectic and energetic exhibition, internationally recognized artists like Ron Burkhardt, Irene Neal, Puneeta Mittal, Robin Antar, Paul Lorenz, Keiko Gonzalez, Gina Rossi, John and Elli Milan, Durand Seay, Shawn Man Roland, Carmelo Midili, Bonnie Teitelbaum, Diane Sanborn, Joe MacGown, Cristina de Castro and Steve Smith combine with Texas talent, including Elizabeth Schowachert, Michael Broussard, Antoaneta Hillman, Leanne Venier, Trent Mann, Judith Seay and Awadh Baryoum to challenge the imagination and to inspire reflection on the intangible.